Give your pup a treat that he deserves by giving him Bil-Jac Grain Free Treats. They are made with real chicken and sweet potato - a taste combination dogs love. They are small in size so they are great for any size of pup too. No worries that smaller dogs will choke on large pieces. I like that because they are small you don't have to break them up to use them as rewards during training. Plus one bag will last you a long time because it has over 300 treats inside. A grain free treat alternative that lets your dog Rise Above the Grain®. No grain, gluten meal or sprayed-on rendered fat. 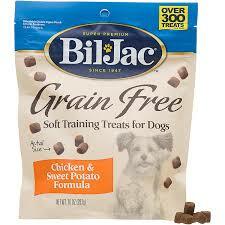 Buy it: You can purchase Bil-Jac Grain Free Treats in stores and online. These look like some great healthy treats for dogs. I think my Lulu would like them.